In order to engage with our members and allow you to have fun on the Toluna site, while winning points we are introducing this new game. We will post ONE puzzler every week. To find the answer, we will give you hints. We will post one hint per day. 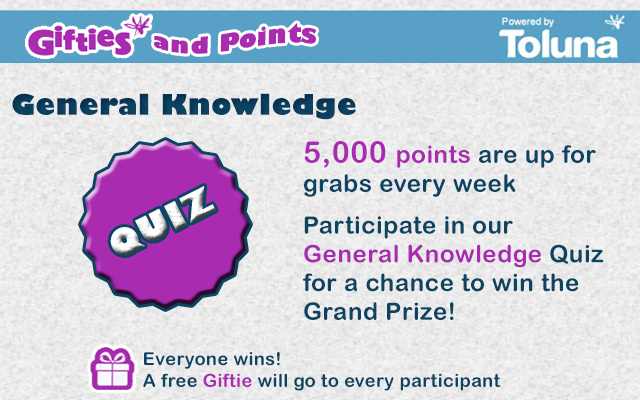 If a member finds the answer from the first hint they will win the Grand Prize of 5000 points. To make things more competitive, the reward will decrease by 1000 points for every hint that we give before the answer is found. If no one has found the answer by the end of the working week (Friday), you will have the weekend to find the answer but the reward will only be worth 500 points after Friday! It will no longer decrease after that no matter how long it takes to get the answer! They found the answer to the puzzler from the first hint. They will win 5000 points and a new puzzler will start on the following Monday. They win 3000 points because it was found on the 3rd hint. Did you understand the rules? If you have any questions or comments we would be happy to answer them.